The latest Tech 10 boots are one of the most advanced boots on the market and developed with the highest standards of safety, comfort and flexibility. The improved anatomical shape helps to provide unbeatable performance. 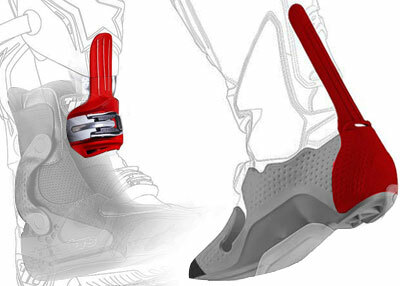 A lot of experienced riders prefer to wear this boot because of the great features. 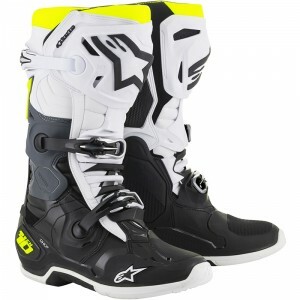 The Alpinestars Tech 10 are also the most used motocross boots by professional riders. 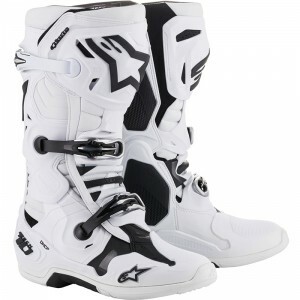 The sizes of these Alpinestars motocross boots run from 40,5 to 49,5. 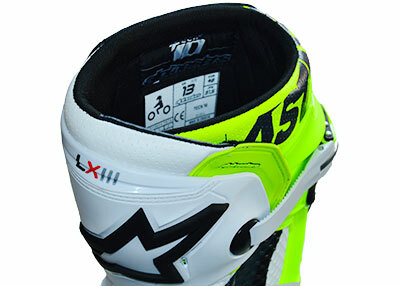 We recommend ordering the Alpinestars Tech 10 in your shoe size. With a half size difference you can best round up to the largest size. If it does not fit, you can easily exchange or return the boots. V1mx uses a 30 day “cooling off” period, which allows you to have enough time to decide. The Tech 10 is full of innovative systems to protect the rider. These advanced features have been made possible by the dedication and experience of Alpinestars as a market leader of motocross boots. Below you will find a detailed explanation of some of the important parts, which help you perform during riding. The inner bootie is equipped with a biomechanical ankle brace that is designed to prevent damaging movements of the ankle. The Hinge systems give you plenty freedom of movement and control. In addition, the inner bootie provides shock absorption and impact protection through various TPU plates with shock-absorbing padding. The Soles are designed to provide maximum grip and durability. 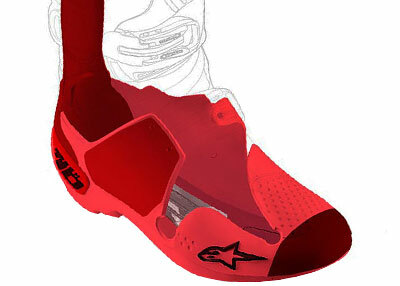 The soles of the Alpinestars Tech 10 consists of 2 parts: complete sole and center sole insert. You can easily replace the sole insert yourself. 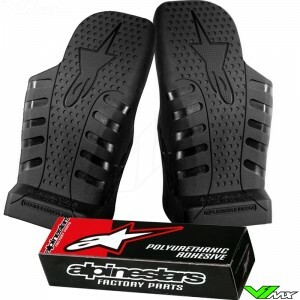 For this you only need to order the Alpinestars Tech 10 sole insert, which is available in the V1mx webshop. The glue is included and instruction are stated on the packaging. 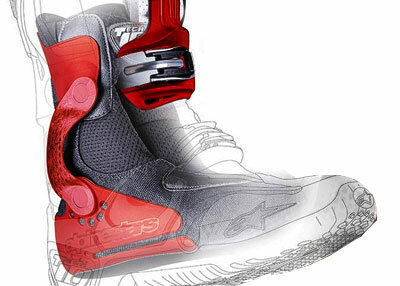 The Tech 10 is equipped with latest generation of Alpinestars buckles. 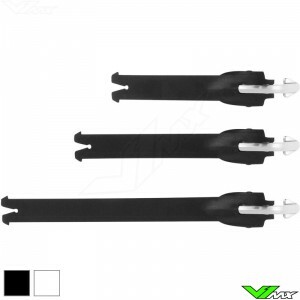 These buckles are easy to use because of the self-aligning system. 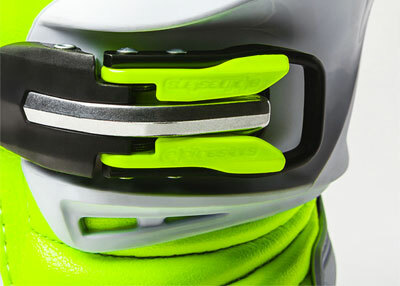 In addition, the buckles have a memory system which allows you to get a constant fit around your ankle and lower leg. They are made from aluminium and are strategically placed to minimize the risk of buckles snapping open. 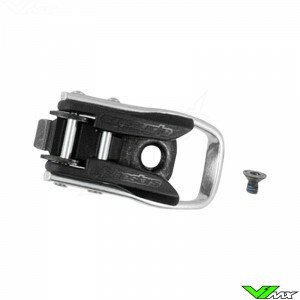 Replacement buckles are available at V1mx. The foot frame of the Tech 10 is made up of 1 parts with 5 different densities. This has been done to save weight and provide flexibility where needed. The unique construction of the foot chassis provides a strong foundation. Using multiple densities allows engineers to make some areas very strong and other parts flexible. Furthermore, TPU material is used in the toe, heel, ankle, shin and Achilles tendon for maximum impact protection. To further improve the protection, Alpinestars has equipped the Tech 10 with several sliding blade systems. These sit on both the front and back of the boot and offer protection against hyper extension. The purpose of the sliding blades is to make movement in the longitudinal direction without much resistance, but to block movements in other directs, because these can cause damage to your foot. 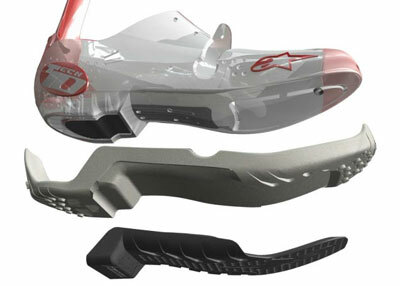 The hinge system and blade system work together to protect riders. The inside of the Tech 10 is designed for maximum comfort and performance. Moisture-wicking material is used for the inner lining. This material ensures good drainage of sweat and keep your feet cooling during long rides. If you are looking for extra ventilation you can choose the white Tech 10 with extra ventilation holes. To make the interior complete, Alpinestars has equipped it with an sole with multiple densities. This ensure good impact absorption and offers a comfortable fit. The Tech 10 is available in a wide range of colors. In addition to the standard colors, limited edition Tech 10 boots are sometimes introduced. The limited editions are mostly introduced at major racing weekends, such as the Las Vegas Supercross and the Motocross of Nations. Keep an eye on our social media accounts to be the first to be notified when a new version will be been released. Only a few limited editions boots will be produced. So be quick, because we usually can’t reorder it. 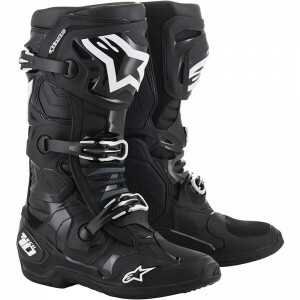 Alpinestars has developed these motocross boots with the feedback from many professional riders. 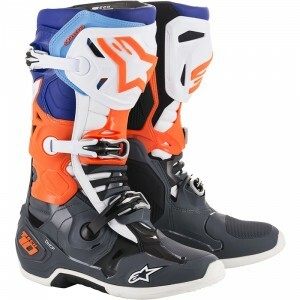 For example world champions Jeffrey Herlings and Romain Febvre both choose to ride with these Alpinestars boots. But it is also popular among riders in the American championship. During the 2018 supercross championship, more than half of the riders rode with the Tech 10. Do you have a question about these offroad boots? Feel free to contact V1mx. We would be happy to help you choose the right motocross gear. Also for question about ordering and shipping you can contact us. We do our best to answer the chat message and e-mail as fast as possible.